Paddle HR helps large organizations match existing talent to new internal career paths. People voluntarily leave their jobs most often because of a perceived lack of opportunities, especially when many organizations are so complex that their employees cannot see the next viable job. By recommending great career options, Paddle HR helps organizations keep top talent and employees build rewarding, diverse careers. Its matching algorithm, powered by 330 million peoples’ career histories, trains its machine-learning models to predict subsequent career moves. The product leverages this intelligence, not only to offer high-level analytics to human resources leaders about internal mobility, but also to provide employees exciting internal career choices. Paddle HR offers a suite of products to improve the career pathing within organizations. Understand how people move within a company historically. Compare internal mobility against benchmarks in the industry and even see where employees go after they leave. Gives employees recommended career paths or jobs within the company. 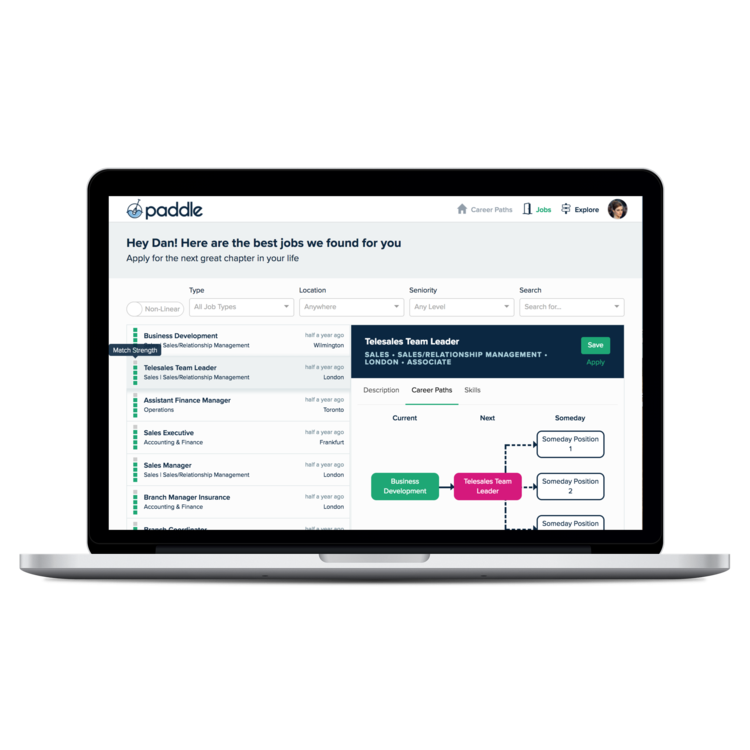 Either white-label Paddle HR’s platform or use the API to deliver the results in your employee-facing tools. Gives recruiters the ability to see which internal talent would be great for current open roles. Set rules about who can be recruited out of their current roles and let recruiters do the rest. Please note: this article was pre-product pivot to enterprise clients, and was focused on an earlier iteration of the platform with universities and students.